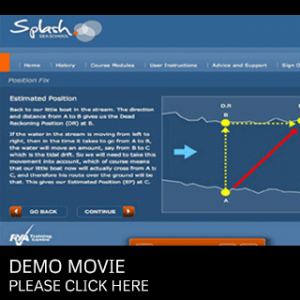 Our RYA Day Skipper eLearning Theory in cooperation with Splash Seaschool offers you the advantage of learning the necessary theoretical knowledge at any time and place. The exam also takes place online. All you need is a computer (PC / Mac / iPad or similar), a modern browser (Internet Explorer, Firefox, Safari) and an Internet connection. Good English skills are, as for all RYA training and later at sea, essential! This RYA Day Skipper eLearning courses are conducted by the RYA Training Center Splash Seaschool. The Swiss Maritime Academy acts as agent and your details are forwarded to Splash Seaschool for further booking formalities. Your tutor John Kelso is an experienced instructor for second language English speaking clients and of course you can contact us at any time.